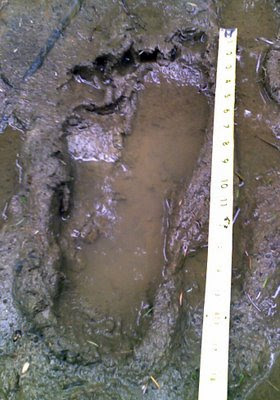 On Sunday April 16th, very fresh footprints were discovered near Quinault Lake, WA. Surprised by the find, and frankly a little unnerved about the nearby forest noises, the married couple retreated to their car, parked a half mile away. They left the area with their their paradigms slightly shifted. 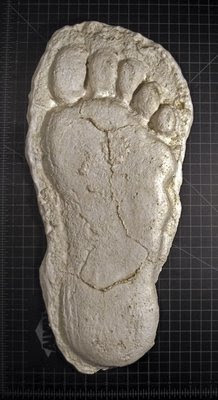 The following Thursday gave an opportunity to return to the site to try to photograph and cast the footprint. It had rained during the previous few days, and the footprint contained standing water when they found it, but it was still in relatively good condition. The print as seen on 4/30/09, four days after its discovery. The water and a passing deer did some damage to the impression, and the cast does not look as good as the photograph of the print might suggest. It was also cast in plaster-of-paris, which does not fare will with water. Still, I applaud the efforts of the witnesses. Not only did they drive the hour and a half back to the location, they packed in the casting material. As if that weren't enough, they photographed the print, and with a scale item! They must be naturally born bigfooters! I give them two thumb's up, and a high-five! I heard about the track find and was sent some photographs and contact information by a good friend back east. I made contact with the witness last week and arranged a time today for me to drive to Olympia, WA and talk to her and her husband about their find. They were gracious enough to allow me to record our interview and to borrow the cast to make a mold of it. I have already cleaned the cast and started the long process of mold making. This will take me a little while, not only because it's a time-consuming process, but also because I'll be out of town this weekend. The cast immediately after cleaning. There is much more to tell about this track find that I know you will find interesting, but you will have to wait for the complete report, which will be published on http://www.northamericanbigfoot.com/. The cast will also soon be featured on the database. 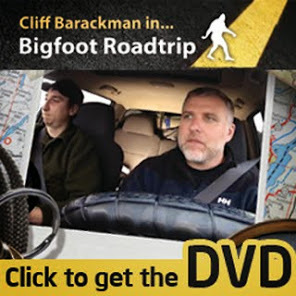 I couldn't possibly sit still long enough to do a proper report because I'm too busy getting ready for the Bigfoot Round-Up in Yakima, WA. I have already vented my excitement in a previous blog, so I won't go into it too much. However, the line up of presenters has grown a little more impressive due to a surprise guest who recently obtained new evidence that will be shared at the event. This evidence won't solve the puzzle, but only add to the rising tide of compelling data available for peer review. This presenter is a good friend of mine, and I put complete trust in his character and word. More on that after the event! I have been asked by the organizers of this event to help them make it a success by bringing some of the more notable casts from my collection. Between the casts that Dr. Jeff Meldrum, Dr. John Bindernagel, Ken and Linda Steigers, and I bring to this event, there could be several dozen examples on hand (or foot?). I am bringing copies of several Freeman prints that have not been available for scrutiny, as they have been in Thom Powell's garage (given to him by Freeman himself), as well as copies of the Skookum heel print, Heryford cast, and several others. If you are attending the Round-Up, please feel free to say hello to me. It's a rare occasion when bigfooters can meet face to face rather than over the internet, and that's definitely part of what makes events like these so special.